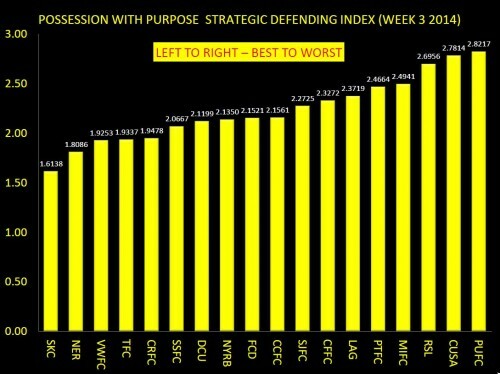 Here's my weekly analysis for your consideration as Week 3 ended Sunday evening with a 2-nil Seattle victory over Montreal. 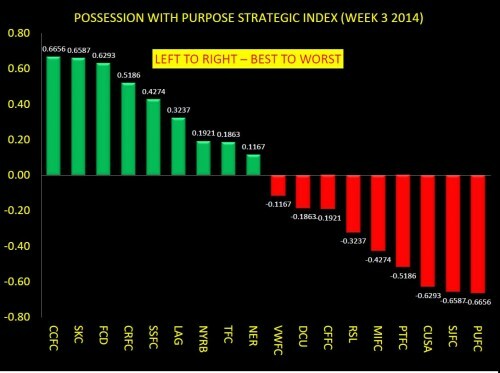 To begin, for those new to this weekly analysis, here's a link to PWP. It includes an introduction and some explanations; if you are familiar with my offerings then let's get stuck in. Note that Columbus remains atop the League while those who performed really well last year (like Portland) are hovering near the twilight zone. A couple of PKs awarded to the opponent and some pretty shoddy positional play defensively have a way of impacting team performance. Note also that Toronto are mid-table here but not mid-table in the Eastern Conference standings; I'll talk more about that in my Possession with Purpose Cumulative Blog later this week. Also note that Sporting Kansas City are second in the queue for this week; you'll see why a bit later. A caution however - this is just a snapshot of Week 3; so Houston didn't make the list this week but will surface again in my Cumulative Index later. The bottom dweller was not DC United this week; that honor goes to Philadelphia. Why? Well, because like the previous week, their opponent (Columbus) is top of the heap. As noted, Columbus was top of the Week 3 table again this week, with FC Dallas and their 3-1 win against Chivas coming second, and Keane and company for LA coming third. With Columbus taking high honors, and all the press covering Bernardo Anor, it is no surprise he took top honors in the PWP Attacking Player of the Week. But he didn't take top honors just for his two wicked goals, and the diagram below picks out many of his superb team efforts as Columbus defeated Philadelphia 2-1. One thing to remember about Bernardo; he's a midfielder and his game isn't all about scoring goals. Recoveries and overall passing accuracy play a huge role in his value to Columbus, and with 77 touches he was leveraged quite frequently in both the team's attack and defense this past weekend. Anyhoo... the Top PWP Defending Team of the Week was Sporting Kansas City. 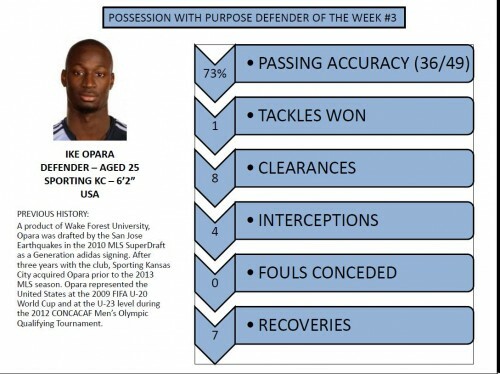 This is a role very familiar to Sporting KC, as they were the top team in defending for all of MLS in 2013. You may remember that they also won the MLS Championship, showing that a strong defense is one possible route to a trophy. While not surprising for some, both New England and Vancouver finished 2nd and 3rd respectively; a nil-nil draw usually means both defenses performed pretty well. Although he recorded just two defensive actions inside the 18-yard box compared to five for Collin, Opara was instrumental on both sides of the pitch in place of Besler. All told, as a Center-back, his defensive activities in marshaling the left side were superb as noted in the linked MLS chalkboard diagram here. A big difference came in attack where Opara had five shots attempts with three on target. 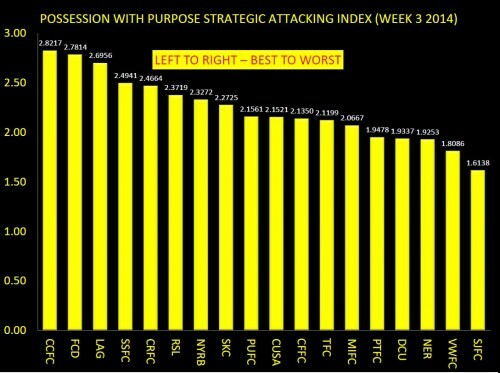 My thanks again to OPTA and MLS for their MLS Chalkboard; without which this analysis could not be offered. You can follow me on twitter @chrisgluckpwp, and also, when published you can read my focus articles on the New York Red Bulls PWP this year at the New York Sports Hub. My first one should be published later this week.